The Launch Pad: About the MTA..
Before I joined the Google Lunar X PRIZE staff, I had heard a great deal about the Master Team Agreement (“MTA”). I’d read the online comments and the associated speculation. Now I’ve had a chance to get to know this document, I can provide a perspective for you. Before I get into some specifics, it’s worth addressing why we have an MTA. In a nutshell, it is to define what needs to be done to win the competition(s) and to provide a legal framework for that. The agreement between the X PRIZE Foundation (“X PRIZE”) and Google that was signed in 2007 includes a number of stipulations about how the competition is to be run along with the requirements for winning the prize(s). Then there are specific requirements that relate to X PRIZE and Google’s goals for the promotion of the space economy and the inspiration of the next generation of scientists and engineers through this competition. Executing on these goals requires agreement on related items such as logo, media tracking, and approval rights. There are also important requirements involving liability (working with rockets tends to raise this issue!) and not very exciting things like the reporting requirements from X PRIZE to Google. All of these items, which are in the agreement between Google and X PRIZE, were the basis behind the requirements that have then been put into the MTA that teams have to sign up to in order to participate in this prize. It sounds simple enough. However, drafting a legal document that can cover all the possible issues raised by 28 teams that are various types of entities (from corporations to non-profits) from many different countries is definitely a legal challenge. In addition, since X PRIZE’s original agreement with Google was signed in 2007, new issues have come to light as a result of either technology advancing, experiences with other prizes, or simply coming across a situation that wasn’t anticipated back then. These developments drive the potential for a rethink or a modification. It doesn’t help that there are several sets of attorneys that need to be involved – Team attorneys, X PRIZE attorneys, and Google attorneys. As team registration closed, the MTA needed to be finalized so that X PRIZE’s effort could shift to the major promotion of the prize and the teams as quickly as possible with a solid framework for the execution and enforcement of the competition in place. The document went through various draft iterations over the life of the competition to date – first as “Guidelines” and since 2009 as the “MTA.” Many hours of discussion at Team Summits, plus follow up with teams and our counsel, has been devoted to going through all the different issues, trying to balance the requirements set down by X PRIZE and Google with the needs of the teams. At the start of this year, version 3.0 was issued and accepted by the vast majority of the teams. Just before the signing deadline, additional feedback was received from the remaining teams and X PRIZE agreed to look at a number of modifications which were almost all favorable to Teams and in most cases were simply clarifications of intent. A version with these changes made was issued, with the expectation that this would be it. Around the same time, X PRIZE began enforcement of the video and blogging requirements in MTA version 3.0. The debate amongst teams regarding these social media requirements and their enforcement is related but a separate issue from the discussions regarding an amendment of the MTA. For the MTA, a further and hopefully final amendment is in draft. It is worth noting that there can only be one MTA in existence. So, if as a result of ongoing discussions, a new version is produced, it will need to be adopted by all teams to replace MTA version 3.0. As MTA version 3.0 is legally binding, there are requirements for enforcement, such as the aforementioned social media requirements. Judging by the ongoing comments from teams, it is this area that is among the most debated. X PRIZE has a number of avenues open to it when a team is not in compliance with any part of the MTA. If it is possible to do so, then a warning letter including instructions on how to get back into compliance is the first preferred approach. If a team does not return to compliance during the warning period, then the team can be suspended and appropriate actions taken while providing another period for the team to return to compliance. If after two such chances, the team is still out of compliance, then the X PRIZE Foundation has the option to terminate, or it may, at its discretion, continue to explore both why the team is out of compliance and whether it intends to come back into compliance. Occasionally, there are very valid reasons (serious illness or legal issues, for example) that make such decisions not-so-black-and-white as to whether to terminate. This all sounds reasonable. Except that for a variety of reasons, X PRIZE hasn’t succeeded in pursing team compliance for all MTA requirements in a timely manner. The reasons relate mainly to major staffing changes over the last six months, as well as limited internal resources. This has led to teams being unintentionally given much longer than anticipated to return to compliance. This is unfair to the other teams who are remaining in compliance and has led to frustration and accusations of favoritism. We deeply apologize to the compliant teams for this but can reassure them that there is no one team that has been given special accommodations. There are actually several teams that remain out of compliance and are in line for suspension, and a number of teams that have been warned. We aim to be up to date by the end of this week on all our warnings and suspensions. I know this doesn’t address the issue of whether the video and blogging requirements themselves are appropriate/fair etc. However, I’ve received all the feedback. Watch this space for more on that topic. 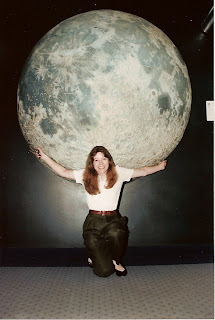 P.S As you can't do a blog post without a photo, I searched for 'moon' in my album and this one from 1994 popped up. I think back then I was hoping humans would be permanently on the Moon by now..